Have you pulled out last year's favorite swimsuit and found that now it doesn't fit up top in the "cup" area? You finally lost a little weight, then found out the bustline seems to be the first to reduce. It happened to a friend of mine recently. Though I might be just a bit jealous of her weight loss, I totally understood the frustration of going from a B or C cup down to an A cup over the winter. Cup sizes can change dramatically not only due to weight loss, but with age, after pregnancy, surgery, etc. If it's happened to you, there's a simple and fast way to fix it. Yes, I know you can slip fillers inside the cup, but did you know they could float out while in the pool? You could buy another swim suit, but who wants to go through all that expense, when you already love the one you have? A few items from the fabric store is all you'll need: about 1/4 yard of stretchy swimsuit fabric (you'll have lots left over) in a color to match the inside of your swimsuit (or beige if you can't find something close), matching thread, and a pair of "Push Up Pad Bra Enhancers" in full size B/C cup from the notions wall. They will have a polyester tricot cover and are made of molded polyester fiberfill. Use a universal needle in your sewing machine. This can actually be handsewn, but is faster with a sewing machine with zig-zag stitch. You're just cutting down and recovering the enhancer pads. This whole fix will cost you less than $10, or much less if you shop around. Here's what to do: First, you'll stitch a plain line around the edge of each enhancer pad, rounding off the edges smaller enough so that they'll fit inside your swimsuit bra cup. 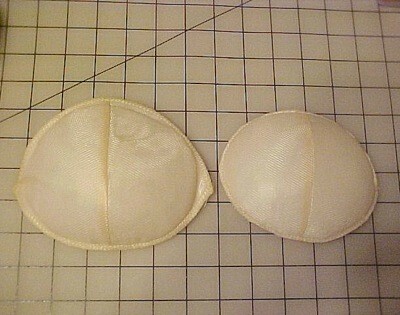 Don't worry if it's not the exact shape, it just has to be mostly the shape and not go outside the seams around the bra cup. Trim away the excess edges of your enhancer pad and make sure it fits inside the cup, stitching back further and cutting away more if needed. This part is a little "trial and error" at first. Look at the picture to see how the shape is changed. Lay your enhancer pad on the table with the inner "bump" side down and the smoothly rounded outer side facing up toward you. Lay the purchased swimsuit fabric over it and smooth it down, stretching gently if necessary as you pin straight into the cut edge of the pad, all around the edges. It doesn't matter if you cut the fabric out at this point or leave it as a larger piece, you only need to have some excess around the edges so you have something to hold onto and keep it pulled out smoothly as you sew. Flip the pad over and zig-zag around it at the pad's edge, sewing through the pad and the fabric underneath, being sure to carefully remove the pins from underneath as you come to them and keeping the edge of the fabric stretched out very gently so that it will stay smooth over the rounded part of the pad underneath. Trim away excess swimsuit fabric close to the edge of the pad, being sure to not cut into your zig-zag stitches on the pad. Now you'll lay another piece of your purchased swimsuit fabric over the inner "bump" side of the pad, pin around it into the edges, again gently stretching the fabric a little when needed so that it'll stay smooth. Flip the pad over, pull the raw edges of the fabric over the previously stitched and trimmed edges a bit at a time as you zig-zag near the edge. It helps to use tweezers to pull the fabric edges away from the needle area and keep your fingers from getting stitched. Go slow, your machine can handle it, just take a few stitches, leave the needle in the down position, raise the presser foot and adjust the fabric a little, so you don't end up with a lumpy seam, put the presser foot back down and keep going. 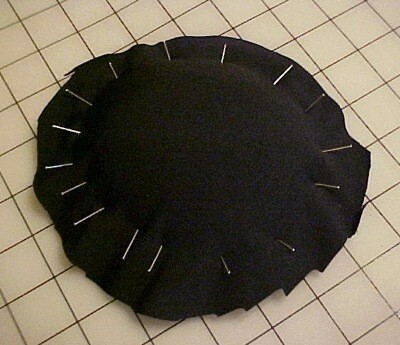 After you've stitched all the way around, you'll trim away the excess fabric close to the zag-zagged stitches. 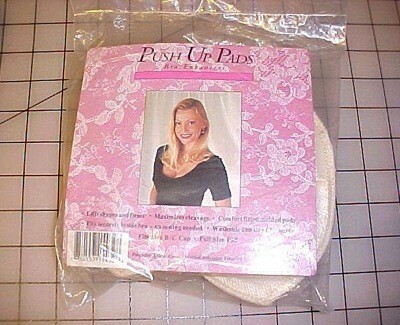 Don't worry that raw edges are there, they won't run and they'll be hidden inside your swimsuit bra cup in the next step. 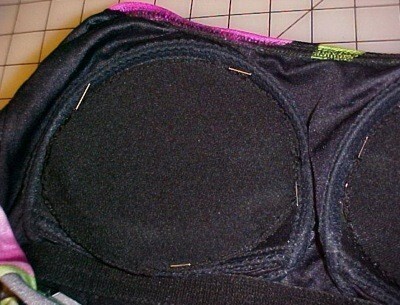 Lay both your new "fillers" inside your swimsuit bra cups and pin in perhaps four places, adjusting the enhancers until they cover the most area and look right in placement to you. That "bump" part goes across the bottom half of the bra cup, it's what "pushes up" any remainder of your cleavage, filling out the top cleavage edge of your swimsuit a bit more for a youthful look. You'll almost finished! 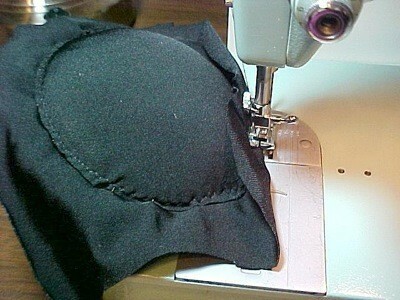 Thread a hand-sewing needle with your matching thread, and slip-stitch around the upper areas of your newly covered enhancer pad, stitching to the inner seams of your swimsuit bra-cup. It's not necessary to sew across the bottom edge, it can be "free floating" so that if you gain a bit of weight back, the cup will still push outwards to fit, but even if you're totally flat, it'll still fill your cup just fine as the bump rests against your chest wall enough to hold the shaped side outwards. This makes a lightweight "fix", that won't fall out or float away like some enhancers, and you can adjust it thicker or thinner for yourself by getting creative with whatever you find at the fabric store. Particularly if your swimsuit if black, this recovered enhancer will almost disappear, so you don't have to be self-conscious when hanging your swimsuit to dry. This "fix" will also usually work to quickly make a regular swimsuit into a mastectomy swimsuit for breast cancer survivors, because the cup is almost totally filled with the pad, and no extra pocket or swim-form is needed.